In the days since Vatican II, the Church has seen an alarming decline in the numbers of young people willing to consecrate themselves to God in the life of religion or the secular priesthood. Why should we be surprised, when the very foundations of the religious life (dogma, purity, self-denial, opposition to the world, etc.) have all been undermined by liberalism and modernism? Regardless of how priests and bishops lately (and for decades) have betrayed their vocations, providing for us the sordid and tragic headlines of the past several months, the Church is still holy. In fact, she is a fertile Mother, ever capable of producing saints. One of the ways that the Church makes saints is by the office of her priests, whose function it is to sanctify others, as “ministers of Christ, and the dispensers of the mysteries of God” (1 Cor. 4:1). Alongside the sacramental priesthood, which is of divine institution, the Church has ever had monks, anchorites, hermits, nuns, consecrated virgins, friars, and other such people who go by the generic label of “religious.” The religious life – the life dedicated to God by living the evangelical counsels of poverty, chastity, and obedience – has, since the very dawn of Christianity, been a part of the Church. While historians may debate who the first monk was (St. John the Baptist or St. Anthony the Abbot… or Holy Elias? ), the ancient character of the religious life is undeniable, as is its sublime nobility and practical value to the work of the Church. 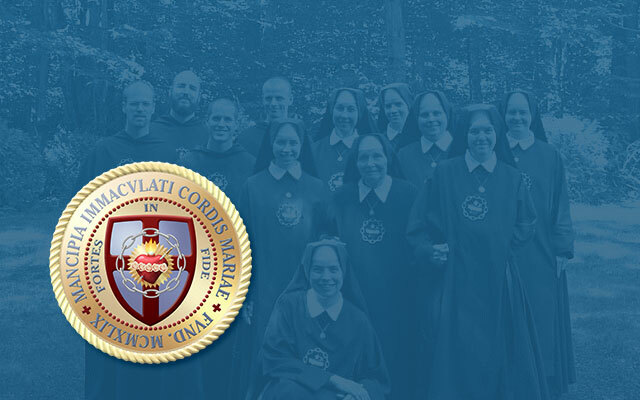 All are called to perfection, but the religious life is a state of perfection wherein, through the living of the counsels under a rule and a superior, an individual may wholly give himself to seeking his perfection in Christ. Recently, we were given the book Come and Follow Me, written by Father Stephano Maria Manelli, author of the very popular Jesus, Our Eucharistic Love. He is the founder, with Father Gabriel Maria Pellettieri, of the Franciscan Friars of the Immaculate, a reform community dedicated to a strict Franciscan life lived according to the Marian ideals of St. Maximillian Kolbe. The subject of the book – as its name suggests, and as the previous several paragraphs also suggest – is vocations. The work is excellent. It should be read by all Catholic youth and parents as well. It is refreshing to read a book – a modern book especially – which not only portrays the religious life as a challenge, an ideal, and a wonderful life for God (all of which it is) but also has the militancy to redress some of the current senseless thinking on the subject of religious life and vocations. “Oh, how evidently lacking in many young people is serious thought, prayer, and wise consultation, when they decide to marry someone without grasping anything at all about the great vocation and great task that couples ‘called’ to marry one another receive from God! For this reason we see many marriages ending in tears and tragedy. “How many young men who marry… are satisfied that they are doing God’s will? How many of them, rather let themselves be conquered by lures of the flesh when they had been called by God to a higher life, to a consecrated life? “How is it, then, that priests, religious, consecrated souls, are so few in the world? Evidently, great is man’s failure to respond to God’s call. But what will be God’s judgment when so many discover that they erred about their vocation and had not even taken notice of the sublime gift of a call from God to the consecrated life? Father Manelli has the traditional Catholic outlook when it comes to the “two vocations,” i.e., married life or the consecrated life in general. He holds, without a doubt, with Our Lord and St. Paul, that the consecrated life is the higher vocation (see Mt. 19:12 and 1 Cor. 7). But like Our Lord and the saints (St. Jerome comes particularly to mind), while he praises the higher vocation, he also pays tribute to the dignity of the sacramental bond of Holy Matrimony. Thus his words above about the seriousness of the “great vocation” of the married state. He points out, in fact, that one of the reasons there are not as many priestly and religious vocations as there should be is that the married vocation is not being properly lived. Abortion and birth control have murdered and contracepted them! “Any tarrying, any delay, can come only from the Enemy; and it can be fatal, as Jesus let that young man understand who, before becoming His follower, wanted to wait a little while in order to say farewell first to his kindred. ‘No man, putting his hand to the plow and looking back, is fit for the Kingdom of Heaven’ (Lk. 9:62). It should be noted that the publishers of the English version of the book inserted the parenthetical phrase “17-18 in North America,” because Fr. Manelli wrote the book with the European system of education in mind. Fifteen or sixteen is when a young person completes the rough equivalent of high school in Europe. What the good friar is recommending is entrance into the religious life immediately after high school graduation. This is anathema to the modern mind: another proof of just how far from the Mind of God it is. ” But let us say at once that every human heart is a little world in itself, and that world is a mystery known only to God. In everyone there are features and characteristics that are unique and not found elsewhere. Nevertheless, the common way – in a sense the universal way – of perceiving Jesus’ call lies in that attraction and spontaneous inclination towards sacred and Divine realities. “Then it will be the part of the spiritual director – always needed – to distinguish the presence of a real vocation and make sure of it, as well of its proper development through the soul’s prompt and conscientious responding to grace. The pastor, the confessor, the spiritual director or counselor has this heavy responsibility; for the task is given chiefly to these men to awaken and cultivate a vocation, to help it ripen, and to see that the soul cooperates with grace as promptly as possible. “He that loveth father or mother more than me, is not worthy of me; and he that loveth son or daughter more than me, is not worthy of me” (Mt. 10:37). “Amen I say to you, there is no man who hath left house or brethren or sisters or father or mother or children or lands, for my sake and for the gospel, who shall not receive an hundred times as much, now in this time: houses and brethren and sisters and mothers and children and lands, with persecutions: and in the world to come life everlasting” (Mark 10: 29-30). As should be done in any introductory work on the religious state, Father Manelli gives a resumé of various different kinds of consecrated life: that of the secular priesthood, the religious life which is primarily active (religious priests, brothers, sisters), and the religious life which is primarily contemplative (monks, nuns). We say “primarily,” because all religious are called to be contemplatives by being deeply rooted in the interior life. (Members of teaching and missionary communities, as well as those dedicated to works of charity, are called to live the interior life as well as the life of an active apostle. Those such as Carthusians and Cistercians, who give themselves totally to the monastic life are properly called “contemplatives” in the strict sense.) In this section of the book, summary explanations of the nature of each vocation are fleshed out with examples from the lives of the saints, showing how each vocation is a distinct call to live the Gospel’s life of perfection. One chapter of the book is especially dedicated to the missionary vocation, a species of the primarily active life. Given the fact that Father Manelli’s own Franciscan community is not a missionary order, his exaltation of the nobility of this life is all the more significant. To show the urgency of the missionary activity of the Church, he begins the chapter by recalling an episode from the Acts of the Apostles, St. Paul’s vision of a pagan Macedonian calling, “Come over and help us!” (Acts 16:9). “People need to be shaken. If they are Christian, they ought to become aware of the serious missionary problem. There are countless men waiting to receive the Gospel and to be fed the bread of truth and eternal life, ‘children asking for bread, and never a crust to share with them!’ (Lam. 4:4). “It is necessary to pray a great deal about this. ‘The harvest indeed is great, but the laborers are few. Pray you therefore the Lord of the harvest that He send laborers into His harvest’ (Lk. 10:2). It is urgent that we appeal to the Lord that He deign to grant many missionaries to His Church. “Call to mind Jesus’ words, ‘Other sheep I have that are not of this fold: Them also I must bring… and they shall be one fold and one shepherd’ (Jn. 10:16). As one reflects on these words, he sees the meaning of all the heroic accomplishments of our missionaries and the burning zeal of the two heavenly Patrons of the missions: ‘Just let me sail over treacherous seas and save a single soul, and then I would die content’ (St. Francis Xavier). ‘Oh, how I would like to have been a missionary from the time of creation and continue to be one until the end of the world!’ (St. Thérèse of Lisieux). Noteworthy of comment in the above passage is the author’s implicit conviction that unbelievers need the Gospel if they are to be saved. In other words, the Catholic Faith and the Catholic Church, which gives it, are necessary for salvation. This is certainly contrary to the beliefs of most so-called Catholics of today, who think salvation can be found in any religion. And this brings us right back to our starting point: The undermining of the Faith, by liberalism and modernism, has caused this decline in vocations, just as it has caused the destruction of the Liturgy, the recent scandals in the clergy, and a long litany of other ills. To recover what we have lost, we must return to Tradition, that is, to undistorted dogma and proper morals as taught by Jesus Christ, the Son of God. The flowering of religious life will be a welcome result of such a divinely given return. Then again, the return of a majority of Catholics to Tradition (the hierarchy included!) could be the result of just enough young people having committed themselves to the service of God. Who knows but God? For the time being, those who are committed to the Church, who do value her traditions, and who wish to extend the Reign of Christ the King, should do what they can to foster vocations now. Besides prayer, always indispensable in the supernatural realm, putting Come and Follow Me into the hand of a young person twelve or over – and getting a commitment that he will read it – is one good way to help. Buy this book in at Amazon.com.